Being a Swiss, of course, I love muesli, and being a human-being, of course, I love cake. Combine both in a healthy (or at least, healthier), delicious, moist + crunchy coffee cake, and culinarily speaking, I'm happy as can be. 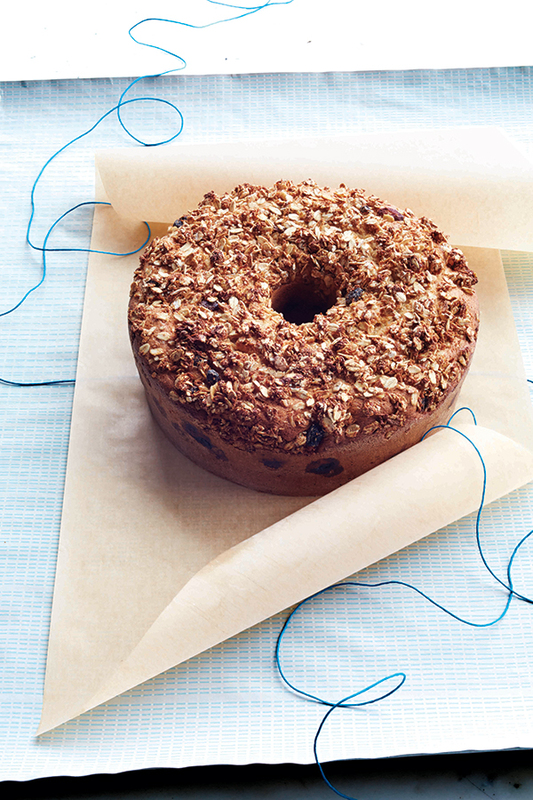 I'm excited to share this muesli coffee cake from Martha Stewart Living with you. White whole-wheat flour —a more delicate version of regular whole-wheat flour— combines with buttermilk and a layer of fresh blueberries for the moistest coffee cake. Get a wonderful crunch on top by sprinkling it with a mix of store-bought muesli and honey in lieu of sugary, buttery streusel. For the cover, they topped the cake with a simple glaze: Whisk together 1 cup confectioners’ sugar and 2 tablespoons milk until smooth, then drizzle the mixture over the cooled cake; let set 20 minutes before serving. 1. Preheat oven to 350°. Butter a 91⁄2-inch tube pan; dust with flour. In another bowl, beat butter on medium speed until smooth, about 1 minute. Gradually beat in sugar until mixture is pale and fluffy, about 2 minutes. Add eggs one at a time, beating to combine after each, then beat in vanilla. Add flour mixture in 3 batches, alternating with 2 additions of buttermilk, beating until just combined (do not overmix). 2 . Combine muesli and honey in a small bowl. Spread half of batter in prepared pan. Top evenly with blueberries. Spread remaining batter on top, then crumble muesli mixture over batter, pressing gently to adhere. Bake until a tester inserted in middle comes out clean, about 1 hour, 10 minutes (if cake is browning too quickly, tent with foil). Cool completely, at least 11⁄2 hours, before removing from pan. Cake can be stored at room temperature up to 2 days. This recipe is courtesy of Martha Stewart (photography by Con Poulos). 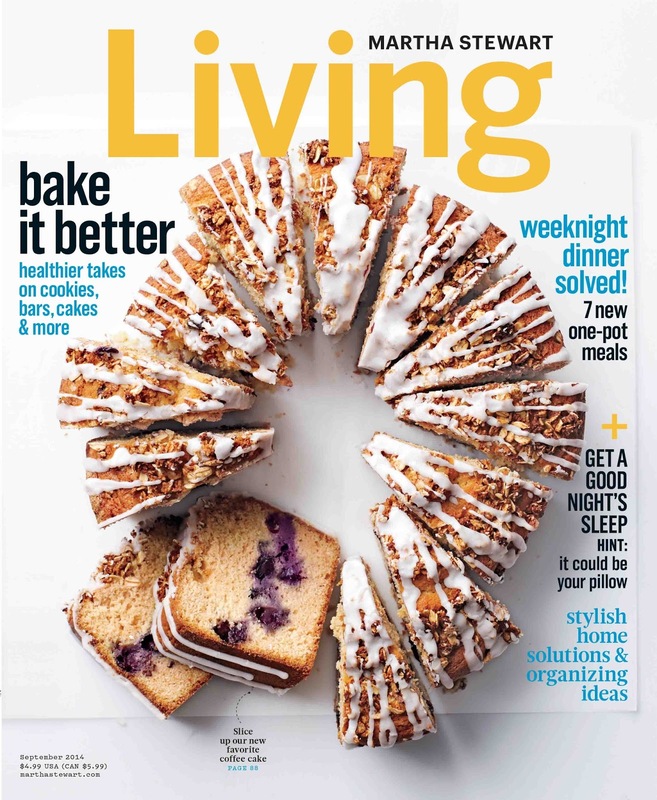 You can find more recipes from the Better For You Bake Sale (healthier takes on cookies, bars, cakes & more that still have the same delicious flavors of the classics), along with plenty of other recipes, crafts, and more, in the September issue of Martha Stewart Living, available on newsstands and for iPad now. This could work perfectly for breakfast on school days where we ignore the alarm a bit too long!!! Might have to make some and keep it on hand!!! oh i have to make this cake! can you used just regular white flour? Yes, but as far as I know, it's recommended to use 1 cup white to 3/4 cup plus 2 tablespoons white whole-wheat. This recipe calls for 3 cups of white whole wheat flour, so you would need a little less than 3 1/2 cups of regular white flour. Oh boy! These looks sinfully delicious! Thanks so much for sharing! Coffee is one of the best healthiest beverage. I am a coffee addict. Coffee is my everyday routine. Without coffee i can't awake. Coffee Bar. This is so delicious. I can eat that forever. Wow! what an awesome idea! stopped me in my tracks and I will def be making those. Thanks so much!